The Animated Woman: ANATOMY - The 14 Year Old Girl. I'm now the proud mother of a fourteen year old girl. Except she's waaaaaay older than that. Indeed, my second child is one of those "old souls". She was born wise. But she's still only 14 and I'm her mother *ahem*. I'm happy to tell you she agrees that this is what the inside of her head looks like right at this moment. Ha. For the record, she's only just been allowed on FaceBook. We're all expecting ... hoping ... ...PRAYING the pie slice will shrink to a 'healthy' level soon, allowing more focus on studies, chores, family time and the word "whatever". So what does the inside of your teenager's head look like? HEY. Where's the section for "Torturer of older sister"?! Teehee. @ Anonymous - The 14 year old insists that she doesn't torture her older sister "as much as she tortures me". 16 yr old girl: 50% "No one on EARTH is as smart as I am" and 50% "No one understands how hard my life is except the little boy...er... "MAN" I love"
@ Peachy1 - Filling sketchbooks is awesome. Can you remember when there was no FaceBook or Twitter. You and I would never have had the chance to become friends. Probably. @ frazzled - I'm scared now. Love it! Sometimes people's funny commentary on teenagers turns judgmental or insulting, but you always seem to get it just right--respectful but pointing out the silly bits! My daughter is seven, and I am currently in denial that teenage-dom happens. In other news. I love that you used the term "Nail Varnish" that is just classic. That looks JUST like my daughter. Almost to a tee. ((sigh)) She's 15 now and I'm dreading the next few years. Aaah, I'm a little worried 'cause that's pretty close to what's in MY head. 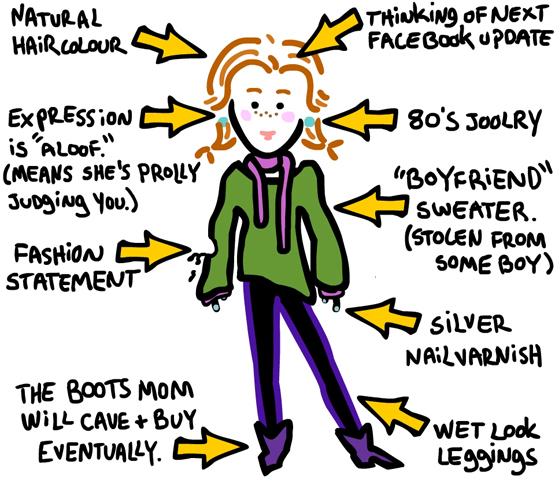 Just found this and it had me laughing out loud..my daughter is 16 but its her down to a tee! She is attached to her phone that is permanently on facebook , always talks me into buying her boots etc, and at the moment is constantly wearing her boyfriends sweatshirt! !